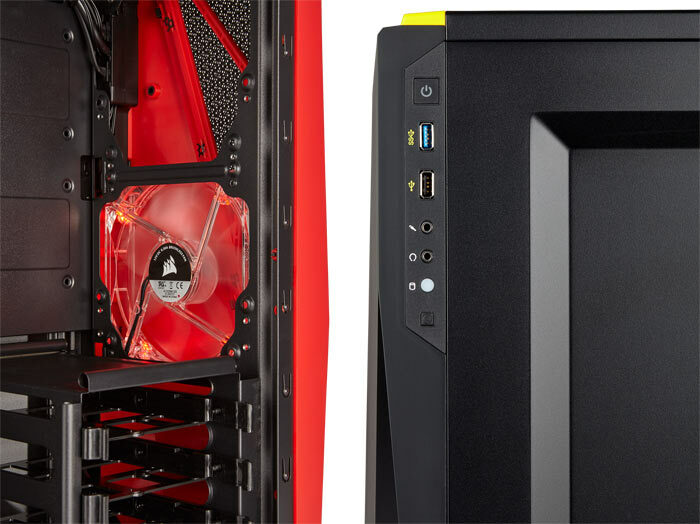 Corsair has just launched the new Carbide Series SPEC-04 mid-tower gaming case. These are roomy chassis (492 x 201 x 433mm) with a 'modern' angular design, a large tinted side window, and room for ample storage, flexible cooling options, builder-friendly cable cutouts and tie-downs, removable dust filters, and a handy side I/O panel. Beyond those appealing features and its trio of modern lures, "Modern Features. Modern Lines. Modern Performance," you can snaffle the Corsair Carbide Series SPEC-04 for under £50. You can see that three for the four front panels are perforated to allow front airflow. Corsair has pre-installed a 120mm LED-lit front intake fan to make something of this potential. Elsewhere in the chassis there is room for up to five further fans; two 120mm or 140mm in the front, two 120mm in the roof, and one 120mm in the rear. One of the 120mm mounts can be used by any 120mm CORSAIR Hydro Series liquid cooler. There's plenty of building and expansion room in this chassis. The SPEC-04 mid-tower supports ATX, MATX and mini-ITX motherboards. Depending on your motherboard choice you can fit up to seven expansion slots to house add-in-cards up to 370mm in length. For storage options there are mounts ready in the SPEC-04 for up to three 3.5-inch HDDs and two 2.5-inch SDDs. Expansive storage space: Easy-to-use mounts for up to three HDDs and two SDDs. In an email to HEXUS, Corsair said that the new chassis series is available immediately worldwide from approved retailers. Pricing varies depending upon region (£49.99 in the UK) but all buyers will receive a two year guarantee. Nice that they're using the same bulgy side panel design as the 500R. Bags of room for cables. Bad move on putting the IO panel on the side, though - Limits the options for case placement. Still seems like a good entry-level case, though. Connectors on the opposite side of the “window”… what are designer thinking? ni case but echo Ttaskmasters comments about io placement, really don't like them on the back side. front or top for me but nice case for a good price. Been thinking about a new case for a month or two now , been more than happy with my Xigmatek Midguard but just fancied a change , I eneded up buying a Gamemax Silent one couple of weeks ago , very similar to a Fractal and amazing value £43.00. This Cosair unit isn't bad for the money but as others state , inputs on side is a no , no, also just one USB3 port , come on.